Customer data platform, data management platform, master data management…these offerings related to management of data have a key to role to play in an organization’s transformation towards customer-centricity. But how these platforms actually contribute in serving a traveller? What else needs to be done to make it an enterprise-wide initiative? One organization that is in the middle of such transformation is Bangkok, Thailand-based ONYX Hospitality Group, with a regional portfolio of over 40 operating properties. “We talk everything in terms of a guest or customer profile,” shared Chetan Patel, ONYX’s Hospitality Group VP Strategic Marketing and E-Commerce. “We are moving towards real-time, 1-to-1, personalised, seamless interactions with our guests. That’s the end goal,” says Patel. The company is working on a new platform, being referred as a CRM platform by ONYX. The team is still in the process of completing what it has set out for. But it does mean that ONYX is breaking shackles in terms of what impedes customer-centricity in today’s complex shopping environment. “This (new CRM platform) is a way to break silos, via a single point of truth. So whenever one refers to a customer, there is one place where there is the end of the line as far as information is concerned. On one side (of the new platform) we have database about the customer and profiling, and then using the data on the other side to communicate with the customer,” shared Patel. 1. Enterprise-level data-driven decision-making: Silos in a business organization exist, and this doesn’t help as the journey of travellers has evolved from being linear to a dynamic one with real-time “micro-moments” in an omni-channel, multi-device environment. So as we spoke of data platforms, Patel did refer to the difference in digital marketing and information management. But, as a result of this new undertaking, ONYX is streamlining operations around data and analytics at the enterprise level. It has been in the pipeline for a year or so. Today travel organizations acknowledge the significance of collection and correlation of real-time event information into actionable knowledge, plus gearing up for sharing of data across business functions, and the information management framework has to facilitate connectors to today’s diverse sources of data. A department has to act, and cohesively the effort needs to serve the guest/ passenger. As for the real utility of this data, it comes from the fact that the entire customer journey is being mapped out. The focus is on how to collect data from each touchpoint and how to interact with the guest – to reach out in a relevant manner as per the booking funnel. “We are basically looking at the CRM platform (with functionalities such as data integration, analytics and integration with web experience management etc.) to do that,” shared Patel. So, as per the latest dashboard based on the data platform, ONYX is capturing data right from what triggers the search to the next trip, and this entails what people tend to do and what are the opportunities to influence the behavior of the traveller. “The entire journey is being evaluated for our own systems and touchpoints,” mentioned Patel. 2. Data in one customer profile, the base for experience and revenue optimization: A vital aspect is responsibility towards collection of data, and this gets incorporated into the customer profile wherever possible. Various touchpoints and people are responsible for collecting data and reaching out to customers, with everything being spoken in terms of “customer profiles”. “There is a holistic approach to the entire strategy – CRM and team, and everything else will fit into this,” shared Patel. So, for instance, a user is looking for a property in Phuket after coming across his friend’s experience. He conducts research, comes across an ad from Amari and clicks on it. This data is available in clickstream, but may not be personally identifiable. But once this user lands on the Amari website, there is a possibility to connect with other aspects of the user’s online profile (for instance, Facebook integration on the website, automatically log on to Facebook part of the website, hotel’s Facebook page is listed on the hotel’s website). “We start joining the pieces of the puzzle. Once they return we glean more information. They click on spa, check spa packages so the web experience platform will automatically start profiling the customer. And it will keep the profile in the background in the data. Next time the same user comes on the website, using this past interaction and browsing pattern, content can be customized. So as per the interest shown, the relevant content can get them closer to a decision or conversion.” In case of first time users, they are profiled on the basis of browsing pattern, and from 5th or 6th page onwards, they are served relevant content. “The web experience platform is in the execution stage, our first website should be live (on this) in September. Also, there is one RFP out there for a CRM system, which will be a single point of truth for all customers that come across us. This system will be leveraged to send out the guest profile information everywhere, and then customize the content, the experience as much as possible,” shared Patel. For instance, post booking, an email confirmation can have cross-selling options depending upon the information from the profiles in the repository. It could be about an upgrade, spa, romantic dinner etc. Similarly, the guest might look for destination-related information or any other section on Amari’s website, this can be capitalized upon during the pre-arrival phase. “So more the customer visits the site, more data is picked by the CRM system. We can personalise based on all these interactions, so better chances of monetization,” he said. As of now, the primary source of data is the company-owned booking channels and PMS. “If any additional data can be collected at the property, we would incorporate that as well,” said Patel. He also mentioned that if the company consolidates the social media log-in say via Twitter or Facebook, then whatever is publically available is also considered. 4. Using analytics for more direct bookings: ONYX is also looking at evaluating the source of booking and then attempting to convert non-direct bookers. So a guest is being targeted with emails, but continues to book with an OTA, then how to attract this customer? “How can we target this guest differently? May be with a much more aggressive offer? May be with a package that has perceivably higher value? Once they are direct, then we can continue to attract them with activities that are special and again based on their profile, keeps them with us,” pointed out Patel. According to the company, 15% of repeat stays from OTA sign-ups to the loyalty programme were direct. 5. Removing pain points during the actual stay: There can be a lot of uncertainties at the time a guest is ready to check-in. The size of the room is one common concern or expectation, for example. ONYX is also looking at the platform to supply critical information at the time of guest check-in and during the course of the stay to make it more personalised and relevant based on past behavior. “You must understand a hotel’s front desk is a busy place. Some areas are process-centric, very operational so actionable information (sitting alongside the PMS screen) needs to help in a quick dialogue based on the profile, past behavior etc.,” said Patel, further explaining his point with a couple of examples. The team would be trained, so if a guest tends to stay in a certain type of room or prefers a particular location, then the staff can offer the same to them. “It is not about monetization, rather customer experience, too,” says Patel. Similarly, if a booking has come from an OTA, then the staff is instructed to collect the email id. “If there is a sports event in the city and the guest has shown an interest in the same, then offering a ticket in an unprompted manner can uplift the experience. Or a property has worked out 10 offers for a particular month, and depending upon the profile of the guest, an email can sent to indicate the availability of a matching offer. This is where we are headed,” asserted Patel. The plan for the future is to evaluate deployment of beacons to relay relevant messages. Of course, ONYX Hospitality Group, like every travel organization, will improve in areas like 3rd party data integration and even bank on improvements in probabilistic device matching to better identify travellers, but with such platform the team has laid a foundation for 1-to-1 communication. Even today, as Patel says, ONYX is capable of responding to each and every message on Facebook in a span of minutes/ hours (the brand experiences most traffic on Facebook) and the team will respond to other channels as well. And it is exploring the option of chatbots, too, considering brands need to automate certain areas of communication. The sophistication level of platforms that are available today and their ability to deal with emerging technology such as chatbots is still not there in terms of the sort of end result that companies are looking for. The only way travel companies can cut down on the probability of an experience going wrong is by capturing all interactions and this is exactly what ONYX is preparing itself for by capturing as much as data they can and crafting customer profiles. 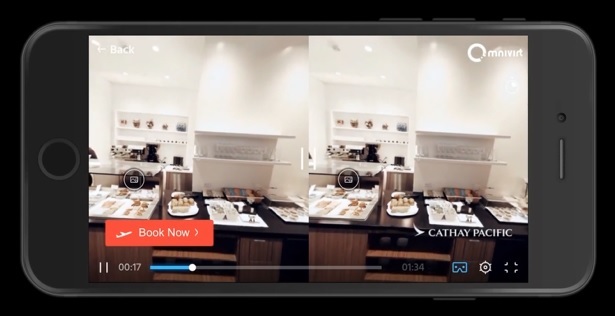 Ai Editorial: How Cathay Pacific and Thomas Cook are looking at virtual reality? Being in a virtual space as if you’re actually there and indulging in something that lures you, excites you is a worthy experience. For travellers, there are plenty of novel experiences that are emerging in the realm of virtually reality (VR). For instance, a family having fun in an interactive virtual environment where each member is using their Facebook photos to customize their respective appearances. Or they can even explore a hotel or the experience of flying business class with an airline, where guests or passengers find themselves in a real-life situation and any query can be answered without leaving the virtual environment. Plus, the idea of completing a transaction, too, is a possibility. 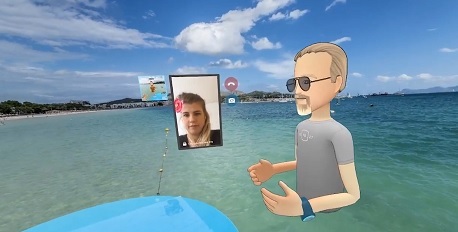 · Travel agency Ving (Thomas Cook Northern Europe) recently unveiled a new initiative featuring a virtual world Facebook Spaces (beta version launched in April this year). A place where users can meet friends and socialize, show 360-images etc. in a virtual world for guided tours. Movies have been produced to show some of Ving’s destinations and hotels, among them the ever popular Alcudia on Mallorca, as well as the Greek island of Lefkas. To visit Ving in Facebook Spaces, users need a Facebook profile and a particular VR-headset; Oculus Rift. “We want to be at the forefront of testing new technical solutions that will help take customer experience to the next level. Previously, a VR experience has been more ‘individualistic’ but now, through Facebook Spaces, we can bring a whole collective of people together in the virtual world. Recently, Facebook Spaces also launched live 360-degree video,” said Karin Eriksson, Social Media Manager, Ving Sverig. For Ving, the objective isn’t only to show content in an inspiring way, but also to enable interaction between more people in the VR world. “360-degree video will develop and become much more immersive as stereoscopic / volumetric video develops. Then we’ll get a real feeling of ‘being’ in a place,” she said. VR headsets, which fit under mobile or tethered categories, have evolved. Specialists recommend standalone virtual reality apps, embedding VR content in a custom-built website, maximising the reach of such content etc. but all of this is still in its infancy. In one of its recent reports, Worldpay, referring to the readiness of virtual commerce, highlighted the discrepancy across markets. In a majority of developed economies, consumers aren’t ready for it. For instance, only 23% of Dutch consumers believe VR devices are secure for making payments. Whereas the figure shoots up to 59% in case of Chinese shoppers. The study also underlined that pricing of advanced headsets from Oculus and Vive, available for over $700, can be a deterrent for initiating any marketing campaign. Plus, the gap between VR manufacturers’ understanding of consumers vis-à-vis the sort of experiences that marketers intend to deliver also needs to be looked at. Eriksson also acknowledged that VR is in its nascent stages. “Consumer VR has only been around for a year, so some may be a bit skeptical about trying out new technical solutions and prefer until someone else has trialed it. That’s a big mistake I think. We prefer to test for ourselves. First on a small scale and then scaling up if the results are positive,” she said. As generally is the case with finalising a budget for marketing, companies generally follow the “70/20/10 Rule” or even “90/9/1” (with majority going to what’s been done over the past few years; next focus on something that has just gone mainstream and last part for testing new concepts/ technology and don’t expect a major RoI). So it is interesting where travel brands fit in VR in their plans as of now. Eriksson also mentioned that Ving sees this as an investment for improving the tour operator’s business. “We already have Customer Service available through Facebook. Through the use of Facebook Spaces we can now provide an extra service that will help assist our customers during the Search and Inspiration phase of their customer journey,” she said. Eriksson shared that a major challenge lies in “creating content that looks and feels as ‘realistic’ as possible, especially with the added constraint of no ‘off the shelf’ technology being available yet that can handle this in a satisfactory enough manner.” But in a few years, it will be possible, she expects. · Being open to experimentation: Eriksson shared that the team, led by IT engineer and internal VR guru Jonas Carlson Almqvist, has been experimenting and producing 360-degree videos for years, with all available to view on Google Streetview. “We’re still exploring ways on how to now make the next step in 360-degree video as there is great potential here to display travel content in a truly inspiring way,” she said. “It would have been a much more challenging and expensive test to run without this (approach towards continuous testing helped),” she said. · Measurement: A way to measure is expand the reach, assess coverage in media etc. “We made press releases in different languages, recorded video material (both long and short videos) and then we posted the posts in our social media channels. You can also register on a Guided Tour in Ving’s VR World via a form. Through these activities we can measure, for example, involvement in social media, film views, how many articles are written about us, etc.,” shared Eriksson. It is important to keep an eye on improvement. “Technology is constantly evolving and the way we experience 360-degree content today will not be the same way we experience VR media in the future,” concluded Eriksson. If one were to offer a fair assessment of the adoption of IATA’s NDC XML standard after five years or so, then “slow” is an apt way to describe the same. This industry is riddled with complexities so such progress is understandable to an extent. NDC is primarily about working out the criterion and workflow of the airline delivering the offer. A key aspect of this plan is to work out a schema that paves for carriers to create and deliver their respective offers to any distribution channel or 3rd party. A standardized schema makes it a scalable, repeatable, and over time economically beneficial process. So in case of any process modification, more so in a sector which has relied on legacy technology, the initial evolution of process, workflow, and featured technology calls for major investment from existing organizations and new entrants. Common protocol lets two systems understand and interact with each other. So definition of seats, baggage fare etc. becomes clear. So if there is a query from a system - how many seats of this class, category are available at this point of time, when this based on a pre-defined protocol, then the other system would be able to respond. According to IATA, since NDC is a standard it will make such connections more cost effective and faster to deploy. If the partners involved (airlines or agents) see value in the presence of an intermediary, the standard can cater for that – and this is where aggregators come into play. They can be incumbents say, GDSs, or new players who are encouraged to offer their services “because the connectivity is fulfilled via an Internet-based standard which makes the marketplace much more open to competition”. So there have been a couple of issues with versions and resulting implementations. The first official industry standard was launched in September 2015 as PADIS version 15.2. Further versions of the schemas are 16.1 and 16.2 while previous versions (1.1.1 and similar) are candidate releases. The evolution of the standard is captured within the different versions, with each new version incorporating improved functions reflecting the feedback from pilots and users. As of now, it seems like over the past few years, there will be evolving versions of the schema that will impact the specific XML messaging, in that messages themselves will change over time – new ones added, existing ones modified, etc. So considering that airlines have developed their API based on a particular XML standard (NDC or even other), it would result in different interpretation of these standards. So for an intermediary, say a marketplace, working on multiple airline APIs calls for normalisation into a single version. It has be to ensured that this move brings down the overall bearing on the content and functionality as worked out by airlines through their APIs. NDC is not only an airline topic as it affects the travel industry across the board. For their part, IATA has clarified that NDC standard is not locked into XML. There have been plans to release a JSON profile as well. IATA’s Industry Data Model initiative is focused on refining messaging standards development capability and enhancing interoperability of systems. As of now (even when questions have been raised whether NDC is truly an open standard or not), the industry is hoping that the NDC version 17.2 would result in stabilization. Travel e-commerce players, including airlines, hotels, intermediaries etc. are finding ways to connect and access inventory and sales systems via application programming interfaces (APIs). Increasing the average order value or targeting a traveller’s wallet via ancillary offerings is one area that is resulting in interesting initiatives. OTAs and even hotels and airlines etc. among suppliers, have access to a substantial base of travellers. Importantly they are the ones with an intent to travel. So how can these organisations scale up their revenues, propelled by APIs? “There is an opportunity for airlines to personalise the trip based on valuable information they already have about passengers (age, destination, leisure or business etc. ), especially related to their respective trips,” says travel technology provider BeMyGuest’s CEO Clement Wong. Referring to the company’s expertise in excursions, activities and day tours, he said that each and every product is on meta-tag, whether it’s suitable for a small family or a romantic getaway or an adventurous trip etc. “We are able to provide of all this information within the API,” he said. “We help airlines and hotels monetize the post flight booking or post hotel booking phase/ customers. Ai Editorial: Stepping up the average order value or targeting incremental revenue per passenger has been identified as one area for airlines to improve upon their financial performance. Revenue from optional services, such as onboard sales of food and beverages, checked baggage, premium seat assignments, and early boarding benefits, hovered around the $45 billion-mark last year, according to IdeaWorksCompany. But if on one hand, a group of carriers led by Ryanair can garner as much as 25% in ancillary revenue as a percentage of operating revenue, the “traditional” category has a fair bit to catch on. 1. Why apt blend of content, data and technology isn’t enough? : For Berntsson, in order to make more money per passenger, airlines need to put more pieces of a puzzle and these are - choice, content, reach, pricing, flexibility, time-to-market, data, relevance and timing. 2. Be open to change: Airlines tends to be operationally, process and cost-focused, and at large aren’t savvy enough to embrace the requisite organizational change needed to become a retailer. As highlighted in one of our recent articles, airlines can start small, in a smart way and capitalize on opportunities. For instance, Paxport referred to the “pre-order” service in Scandinavia. 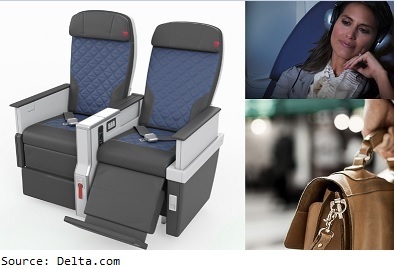 “Airlines experience a ‎€70 average order buying, very often with a 15% conversion. Customers can choose their duty-free in advance. Technology isn’t an issue rather the drive or willingness to do it is the biggest hurdle. Look for right KPIs and return on investment with whatever is being done. Airlines should look at the 15% conversion rate rather than worrying about .5% fulfillment error! The number of airlines opting to alter their respective commercial strategies have only been few till date. 4. Evaluate connectivity for differentiated content and offers: Airlines can refine their API connectivity and are trying to work on an exclusive basis or in a tailored manner for their offerings with intermediaries. For instance, flight offers and bundled ancillaries for certain routes for a specific agency or a tour operator. Changes are being made in the merchandising engine, rules are being defined, content is being delivered etc. So this doesn’t involve any traditional means of distribution. Also, when we talk of distribution of content via an API, airlines need to be wary of the initiative. NDC is essentially defining the model and workflow of the airline creating and delivering the offer. The very nature of the NDC initiative is to create a robust schema that enables any airline to create and deliver its offers to any distribution channel or third party entity. As we highlighted in this article, there are airlines which have implemented NDC APIs, but have no real strategy on how to improve their distribution-related KPIs. Just implementing some NDC APIs will not drive revenue, nor improve customer service. Berntsson agrees and says NDC will not make airlines better retailers, but it will make it easier from a technological stand point. NDC and One Order are fine, but “it is about a lot of different things; to become merchandisers, to know your customers better etc. – some are getting there slowly but surely,” he says. So be it for what, when and how to offer to a passenger, drifting away from the status quo, embracing change as an organization or making the most of NDC standard, airlines need to be swift to step up the average order value. 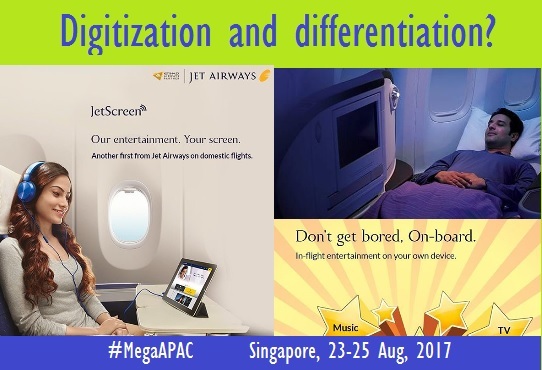 Hear from senior travel industry executives about digitization, differentiation and NDC at the upcoming The Mega Event Asia-Pacific 2017 - 4th Annual Profitabilty Summit, to be held at the Grand Mercure Roxy Hotel in Singapore (23-25 August, 2017). 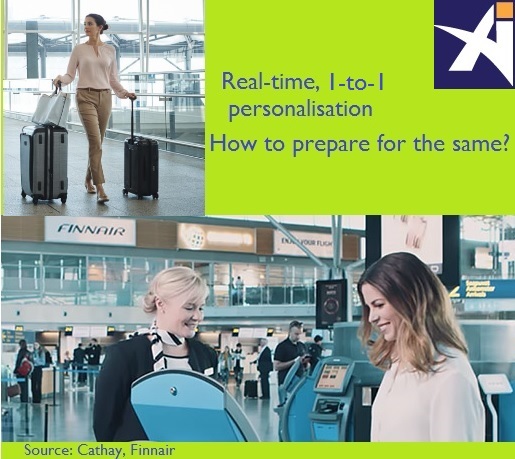 Airlines have been contemplating initiatives about personalisation and big data. Now is the time to act on something small (and build on it), says Boxever’s Enterprise Sales Director, Liam Ryan. “If you start small, one can in effect prove one simple use case. Build on it, two use cases, three and more, and not within a span of one year or months, rather in a matter of weeks, $ or dollar return and value for your customers can be shown to the airline,” recommends Ryan. Ryan says the likes of airlines and OTAs find it tough to deal with various sources, both homogenous and heterogeneous, data sources. And then the hurdle is how to put it together. “Once an organization can put it together, then they have the ability to figure out what they want to do with it,” he says. He goes on to explain how airlines can be precise with what they intend to, and then build on the same to craft a “personalised, special moment just for passengers, and a result airlines ends up offering value to them”. Data-driven organizations ensure their customer data collection fits in with constantly evolving behavior based on their context. So if an airline doesn’t end up connecting the dots and act on the context of a situation, then it would end up missing out on optimizing the experience. Further, Boxever asserts that in order to attain personalisation at scale, it is vital for any organization to being able to merge all of their data, to personalize with the help of artificial intelligence (involving data science and decision making algorithms to handle increased complexity) and finally to engage across every channel – in essence to be available where a consumer is, not where you’d like them to be. If anything is disconnected, it won’t work. Ai Editorial: Digitization and selling a differentiated product, what’s there for airlines to assess? Digitization is a core focus of enterprises today, one that results in relevant response to every customer interaction, data-driven decision-making across the entity, ability to differentiate the product, quick introduction of products etc. Of course, IT and systems need to support digitization. Internally airlines have to gear up for apt IT infrastructure and refine their merchandising, e-commerce capabilities. So, if an airline intends to work with a tour operator, how quickly rules can be defined in the merchandising engine to offer tailored bundles via standarized connectivity that results in control? Another area that needs to be assessed is streamlining of the overall functioning of the industry, for instance, the reliance on business processes that are still based on the paper-based workflows. If the combined impact of complexity in both technology and distribution leads to inconsistency for the passenger, then there would always be a gap in the passenger experience. If an airline is gearing for the digital world along with the interfaces, passenger-facing systems, data collection, and data processing on top of the legacy systems, then is it the right approach? As a section of the industry asserts, don’t overlook the limitations of legacy systems as they can’t deliver in certain areas because they were never designed to. If we talk of agility, why do airlines tend to miss out on creating the offer themselves? What should they offer in real-time? Why aren’t they showing the product despite investing in the same, be it for aircraft, meals etc.? Do complexities like interlining hamper the direct creation of offer? Friedli says there are several reasons why airlines may not be as agile as the consumers expect, and as consumer retailers or other industries may be. One of the major drawbacks for those airlines that chose to use ticketless systems has always been interline and codeshare distribution with most carriers that do have the traditional ticket-based systems. “One (challenge) certainly is interlining, although that is not the main driver,” he said. (This is understandable as it is an industry transition phase and interline partners will likely still require the legacy connectivity to be maintained and you will still need the legacy systems to distribute through traditional GDS channels until a critical mass is built in the NDC Aggregator channel to replace it).” Others are the complexity to distribute any product through any channel very quickly and easily,” Friedli says. According to Friedli, it often takes 9-12 months to get a product live in all channels, and that makes for a very expensive launch. Another reason is the lack of ability to ‘test and learn’ – meaning the ability to try a new product quickly and easily, with little investment, and to test this across various markets – ceasing sales if the product is not successful. “That means, each implementation is a large risk because considerable effort is required for an implementation. Should the product fail, it could end up being an expensive investment,” explained Friedli. So airlines need to automate every aspect of test and deployment, and release fast. Architecture is one critical aspect of digitization, and it is all about agility and speed-to-market. Also, airlines need to reach outside their own sales infrastructure with the same capabilities that they can do internally, such as through their e-commerce site. Standardization of the IATA NDC XML schemas is playing its part here - a communications structure to support dynamically-created messages that contain varying and targeted offers, potentially specific to each customer. As for offers, airlines need to work out a mechanism that can take all the data points, checks business rules and availability, bundles the offer items, calculates the pricing, and deliver it along with branding and rich media to the passenger. Airlines have been separating core functioning of a PSS that are needed to run operations, and opting to control their own merchandising, e-commerce and API technologies for differentiation. “It is foreseeable that more and more of the offer creation process will be done by individual systems. Some may be within the PSS, others may not. That isn’t relevant. It is about combining the revenue management with the product variety and price determination. Mixing that with segmentation or personalisation, and understanding the context of a request – that is where airlines are moving to. Currently, systems are being developed to enable this, and NDC and “API-zation” in general is enabling the airlines to then push these intelligent, contextual offers out to the customers,” mentioned Friedli. Ai Editorial: Targeting traveller’s wallet? Don’t miss out on meeting mobility needs! Bookings for ground transportation and mobility at large haven’t been streamlined yet. They aren’t booked as some of the other trip essentials, say hotels, car rental or flights, are shopped for. 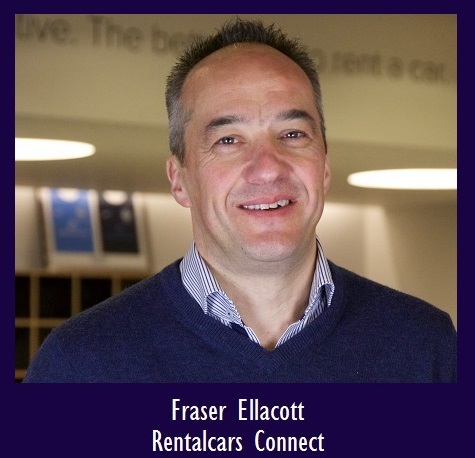 Ai’s Ritesh Gupta spoke to Rentalcars Connect’s MD Fraser Ellacott about how this lucrative pie is shaping up. What can simplify travel shopping? If one scrutinizes overall trip planning and booking process, then the time spent on taking a decision, buying trip essentials from various merchants, completing a transaction without any hiccup etc. are some of the major hurdles that can hamper the experience. Travel suppliers and e-commerce intermediaries are assiduously looking at the blend of content, technology and data to figure out the intent and come up with a relevant offering as per the stage of the journey. The key here to be a part of those, as Google says, “micro-moments”. These moments can be scattered across various ecosystems, such as Facebook or Google, airline.com, OTAs, meta-search engines etc. · Seeking details from a chatbot and eventually completing a transaction. · Interacting with a family member over a messaging platform, deciding on a restaurant and ordering a cab together from respective locations. · Starting a search within in an ecosystem, say Facebook, and with just one more click gaining access to offers from different vendors to book! So the onus is on the entire travel e-commerce sector to be a part of this era of seamless, contextual shopping. Established organizations like the priceline group are looking at the entire travel booking funnel, and it is clear that they aren’t averse to embracing change and astutely looking at the collaborative route to break through the shackles of complexity. For instance, booking.com is now looking beyond accommodation. The team is always evaluating new ideas, like the new chat interface Booking.com Assistant, for example. As for content, bookings aren’t just restricted to conventional or long-established options – be it for accommodation or transportation. 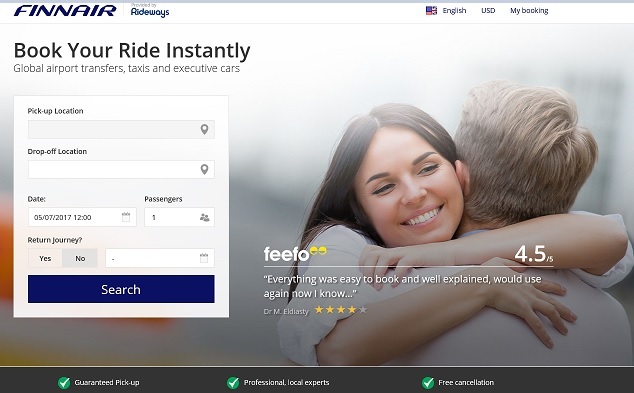 So, another priceline company, B2B car rental specialist Rentalcars Connect, is keen on expanding its “ride” and “drive” offerings. “If one considers a trip for a family, it would feature airport experience, then reaching to the accommodation booked for the destination, getting around via various ground transportation options…it’s about offering easy solutions to all of this, and we are looking at content to match the needs of travellers,” shared Ellacott. Ellacott acknowledged the evolution of booking.com and mentioned that his team is closely aligned and supporting the broader portfolio. He added that in-trip experience and excursion do account for massive share of a customer’s wallet. Overall, the car rental category stands at $60 billion and ground transportation $200 billion. If we talk of bookings on the excursion side, there is a big gap as of today. As for the opportunity, as per my recent experience to Iceland, it took 5-6 sessions spanning over a week to understand the location and the sort of in-trip experiences that suited my preferences. For a couple and child (kid under-11 is generally free to travel) one can spend around $1500 or so for 4 day-long excursions (two of the most costliest tours and two starting range ones) as per the price list of itineraries being sold by two of the leading bus operators (the most popular transportation other than car rental). If we Google “Reykjavik to Jorkulsarlon, an exotic 700 km return, 12-hour road journey”, there are only few bookable options, although there is plenty of content from review sites, blogs etc. including Lonely Planet, Viator, there was only one vendor and that too at the bottom of the search. Even post booking, there wasn’t any proposition considering the data trail - Google (search, videos, check-in details with Gmail), Booking.com, Airbnb.com (including clicks on the “experiences” section) and Finnair. When companies open up their respective APIs, as we have experienced, it results in experiences that save consumer’s time and effort. In fact, simple interfaces or the post booking service aspect via timely reminders or notifications, can get customers hooked to book often. But airlines do need to facilitate sharing of data, although the reluctance to do so is also understandable. But, as Ellacott also says, data is key to raising the conversion rate. “We have over 400+ strong team that is involved in testing and iteration to work out best possible options,” he said. Initiatives like A/B testing are done and airlines tend to benefit from best of the results. Ellacott, who has worked with three airlines during his career, said airlines need to step their data sharing capabilities, and tend to opt for white-label solution since it is easier to work out technically. “Ultimately consumer knowledge is power, there is a need to understand how engines behind the product work and accordingly one can personalise the offer. Those airlines that invest in this are well place to capitalize on this,” he said. Other than airlines, Rentalcars Connect is exploring possibilities with various ecosystems to capitalize on the intent of the travellers. “Social media, review sites etc. are rich in terms of consumer data, and imagine how significant the opportunity would be when one can refine and present with relevant options, be it for a business or leisure traveller,” said Ellacott. Indeed big OTAs are well-placed especially using scale to their advantage, as they are able to address issues with talent, technology and capital, and be part of the emerging trends. It is clear that established online travel groups are in a position to broaden their partner base, be it for top of the booking funnel and moving down, for instance, partnering with an airline when abandonment happens on their airline.com. “We don’t prioritize investment or show inclination toward any one partner. But do we work closely with airlines to make them understand the significance of intent, not to bombard customers with irrelevant options across various touchpoints, rather streamline the booking flow with vast products to choose from but only presenting refined, best suited options. Also, being sophisticated with retargeting in terms of relevance, frequency, and maximize the attachment rate. If done in an unplanned manner, then retargeting can adversely impact the brand loyalty as customers tend to unsubscribe, get annoyed,” shared Ellacott. In all, Rentalcars Connect is forging data-driven partnerships with various stakeholders. Ellacott mentioned that in addition to content, data and integration of the offerings, payments in another area of focus. Also, it is imperative for the company to keep a tab on how some of the trends are expected to impact the functioning of the car rental industry. So be it for self-driving technology or evolution of the traditional car rental model, Rentalcars Connect’s leadership team is constantly evaluating how mobility is shaping and how in certain markets people are going about car ownership. A case in point is peculiar ways in which China has shaped up over the last 18 months or so. For instance, in first- and second-tier cities in China, car sharing has gained prominence, a trend unsettling what was once a key segment for car ownership. Supply of ride sharing services has resulted in extra convenience for short-distance mobility requirements. “We are observing trends in China, this market is going to leapfrog compared to any other when it comes to mobility,” said Ellacott, referring to access vs. ownership as well as China-based bike hire company Mobike gearing for operations in Manchester and Salford. The GPS-tracked smart bicycles can be locked anywhere and unlocked using a smartphone app. Hear from senior travel industry executives about latest trends in ancillary revenue generation at the upcoming The Mega Event Asia-Pacific 2017 - 4th Annual Profitabilty Summit, to be held at the Grand Mercure Roxy Hotel in Singapore (23-25 August, 2017). Ai Editorial: Is NDC paving way for airlines to reassess commercial strategy? IATA’s NDC standard is into its 5th year. The pace with which the standard has progressed has been slow and even the implementations haven’t been uniform. Objectives of airlines have been different, too, and from time to time, it has been mentioned that there isn’t any agenda against the “middlemen”. Nevertheless, the standard has resulted in few peculiar moves from established carriers in the last couple of years. The number of airlines opting to alter their respective commercial strategies has only been few till date. It is understandable considering the sort of contracts that have been signed over the years as well as the tightly integrated processes on which the whole chain functions. In this context, the recent decision of American Airlines to offer a commission of US$2 per flight segment is interesting as it being described as the “NDC commission”. Moving on from cost differentiation? Prior to American’s latest move, there were a couple of components as far as the divergent take on the commercial strategy is concerned. First, cost differentiation. This is what Lufthansa, British Airways etc. 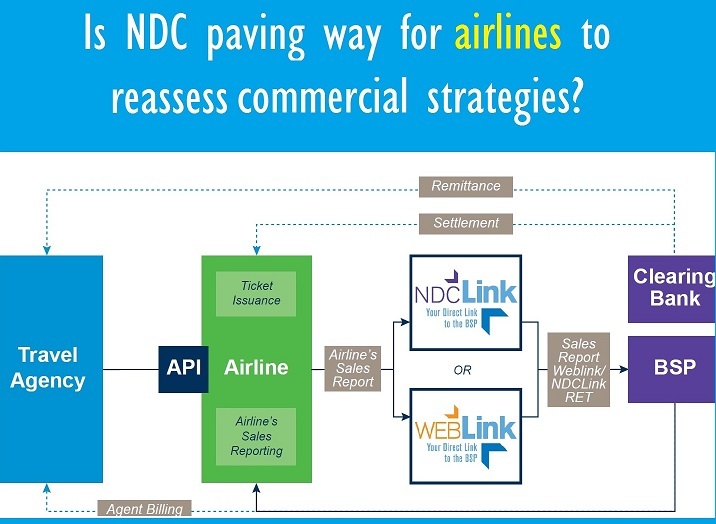 have chosen - levying a surcharge for every ticket issued by a booking channel using GDS and the same not being applicable to airline.com, NDC-(IATA’s New Distribution Capability standard) connected channels and self-booking tools connected via NDC etc. Airlines assert that they aren’t complete users of services offered by GDS, and there are others, too, in the value chain that use them. Second, although ongoing contracts can be inhibiting, airlines have been trying to work on an exclusive basis or in a tailored manner for their offerings with intermediaries. For instance, flight offers and bundled ancillaries for certain routes for a specific agency or a tour operator. There is also scope for integrating content (product descriptions, images etc.) here. Whether American Airlines’s new move is a prudent for one or not from the perspective of its impact on various stakeholders it is being debated. But it does involve NDC. The airline is offering a commission on what is being termed as “AA NDC Net Tickets”. Yes, it is about commissions and incentives. It features NDC Incentive Program, for agencies. They need to book and ticket American flights through a “qualified NDC channel”. According to an official statement from American Airlines, agencies will have access to the best published fares made generally available to the public (e.g., through AA.com or a GDS), and all schedule information and seat availability related to such fares. Plus, they would have the ability to put up for sale particular ancillaries. So in a way, American has gone forward and is offering a flexible alternative to agencies. As for concerns pertaining to what NDC might do, even though it plans to do away with commoditization of air travel, it is being suggested that it will put an end to comparison shopping. But there are industry executives, who are defending this part, too. “It (NDC) does pave way for a like-for-like comparison where the consumer can see exactly what is included in the offer price from one airline versus another airline’s offer,” a source stated. “The current pricing model is bizarre, any airline will tell you the current availability using RBD letters and single digit numbers, every step including ticketing, revenue accounting, reconciliation, interline billing, agency settlement, etc. has added and unnecessary complexity,” an executive told me previously, defending the plan to put an end to pre-filed fares, and putting in a request to the airline to come up with an offer for the indirect partner. 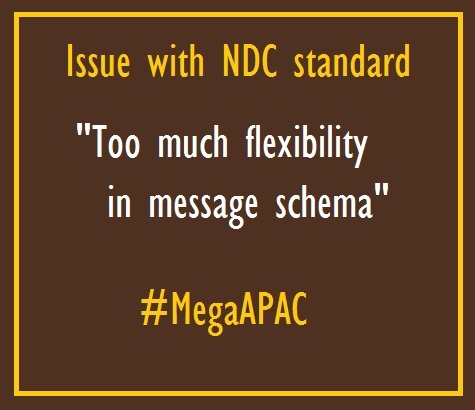 The debate around the utility of NDC, as a standard, has been going on since its inception. Airlines have been working on the objective of letting sales partners connect to their IT systems directly based on the IATA data standard. Are these new connections, based on the NDC standard, going to trigger new commercial agreements? Are GDS going to amend the contracts and avoid any possible complexity related to interfacing and data flow? There are still two points that need to be sorted out before NDC as a standard gains further traction and elicits better response from intermediaries: in case of IATA’s NDC XML standard there has been criticism in terms of too many versions, and too much flexibility meaning implementations haven’t been uniform. So with NDC version 17.2, what sort of work has IATA done to bring about stabilization? Also, airlines that already have API XML connectivity tend to have it in a proprietary way. The consequence is that implementations with new partners take time and are costly as they are all unique. For GDS, it can be extremely challenging as not all airlines choose to participate in and utilize the same standards. Also, they need to support standards for all suppliers of content – including hotel, car, rail and cruise content, for example. Enterprises across different sectors are evaluating the scope and journey of digital transformation. Prioritizing speed is of essence - for employee-enablement that supports lightening fast, data-driven decision making; instant, relevant response to every customer interaction; digitizing existing business models/ quick introduction of new offerings. Of course, business continuity is one major consideration. Enterprises have to move forward with their day-to-day tactical projects and at the same time gear up for long-term strategic initiatives. Dublin, Ireland-based Datalex, in one of its recent blog posts, underlined that the incorporation of 'digital' into the transformational concept carries a risk of adding “too much into the scope”. Blair Koch, Datalex CTO and President USA, emphasized that one needs to be pragmatic when it comes to how to involve various business functions. He mentioned that airlines need to abstain from unnecessary inclusion of all departments. This would only end up impeding the pace as well as the overall outcome of the project. Also, Koch adds that it is “clearly table stakes for a digital transformation to deliver an exceptional omni-channel customer experience through digital channels like mobile, traditional web, chat, SMS, airport kiosks and airport signage”. But what else should be looked upon as far as scope of digital transformation is concerned? That’s an independent journey for all entities, and this needs to be ascertained properly. Koch underlined that airlines need to look beyond just a retail platform, rather they must opt for a digital innovation platform for agility and speed-to-market. Also, before embarking on such a project, airlines can also ascertain complex issues related to what’s expected from IT. This is critical considering the fact if an enterprise is gearing up for self-serve IT process for each line of business users, then apt IT operating model is needed. It would be apt to say that in today’s world of development cycles and new technology advancement, “leapfrogging” is a dying art. Also, full service carriers can’t avoid this question – is maintaining legacy technologies taking IT’s focus away from transformative initiatives? Overall, IT needs to propel business strategy – to digitize the business, and benefits key stakeholders – employees and customers – in an earnest manner. There are several areas that are being probed and this is generally same for all enterprises – how to shape up the organizational change, the role of senior management, the sort of IT architecture required etc. But there are airline-specific issues, too. If we talk of IT, then there are a couple of key aspects. Do finalise an underlying architecture that is flexible and extensible in order to support new products or services, in addition to leveraging new industry initiatives like NDC. Modern merchandising and pricing engines do not operate independently. Rather they need to integrate data from various sources, including on-boarding data from external sources, therefore “connectability” is critical. Also, each engine needs to support data-driven decision-making and be aligned as per the business model. For instance, airlines are already deploying merchandising rules that control their business model and managing their own product propositions (inventory, availability, price, product biasing etc.) according to market demands and opportunities, whereas before, business model changes often required a change in the code. By the time the changes made their way through the development cycle and reached the production system, the market may have already moved on, leaving their changes much less effective. Another significant area is managing data and acting on it. Today integration of data needs to managed from numerous sources and of varied structure and format. A key area of such integration is accessibility and another is moving the data from source to target. Also, digital enterprises are going after real-time monitoring of patterns and sequences of events, acting on even high data volumes from multiple input data sources. So how are preparing for extracting and acting on data? As we reported in case of flydubai, multiple building blocks is the way to go in order to attain agility and flexibility. The approach is API-led connectivity. The first layer is systems APIs (for accessing underlying systems of record), second is process APIs (provide access to non-central data, designed specifically for processes in an organisation) and experience APIs (optimization of content, paving way for channels to access data in a desired format and accessibility for devices such as wearables, how the information is displayed on any particular device). On this platform the carrier managed to transform the core system (PSS) of the airline that needs to be ready for digital transformation. The team designed the middleware around offer management, order management and customer management. The API gateway exposes all these APIs to business partners. The value of APIs lies in their ability to help in discovering new use of data. Travel technology specialists are also working on new platforms where real-time business intelligence can be leveraged for personalisation of offers. Also, the platform, running in parallel to an airline’s PSS, would feature complete PSS booking connectivity and document processing capability. The journey of airlines, be it for low cost carriers or full service airlines, is going to be different, each can chart their own path. Digital transformation isn’t new anymore, and there are plenty of lessons to learn from. Define the scope appropriately, embrace fast iteration concept approach and definitely avoid expensive product development approach. Keep passengers in the loop - how much change are passengers willing to accept? And act accordingly.